The Bushnell Brotherhood of the University of Nebraska was founded as a local fraternity in September of 1910. It was a group of male students who came together with the goal of becoming better Christians and improving their living conditions. In October of 1910, the name of the organization was changed to the Bushnell Guild. During its early years, the Guild thrived on campus and attracted more men to their cause. In 1915, a Congregational Guild in Illinois wanted to use the name of the Bushnell Guild. This permission was granted, and in 1918, the Lincoln chapter initiated the Champaign chapter, which adopted the then existent ritual and insignia. 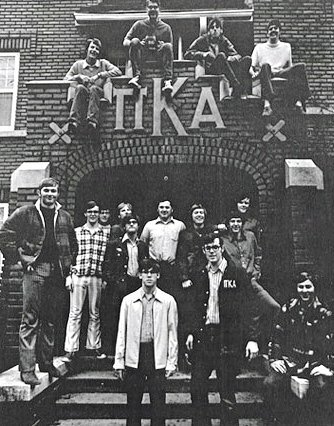 The Champaign chapter later became affiliated with Alpha Kappa Lambda, a national Christian fraternity on the Pacific Coast. The Bushnell Guild rented a chapter house at 1701 L Street until the spring of 1922 when the fraternity purchased a residence at 1141 D Street. In that same year, the Bushnell Guild began negotiations with Pi Kappa Alpha for a national charter. The Guild was visited by the Grand President of Pi Kappa Alpha on April 10, 1922. On April 12, 1924, the fraternity was installed as the Gamma Beta chapter of the Pi Kappa Alpha Fraternity, and the initiation of the actives and alumni of the Bushnell Guild into Pi Kappa Alpha took place on April 19. More recently, the Gamma Beta chapter was rechartered in 1999. Since then, our chapter has won nine Smythe Awards. The Smythe Award recognizes overall chapter superiority and prominence and are given to the top 5% of chapters annually.